Placental abruption and placenta previa: abnormalities which can cause third trimester bleeding, and premature birth. Having a child who is more likely to have ear and respiratory infections and allergies. First, write down your reasons for quitting (or reasons for your partner to quit). Next, pick a quit date; write it on the calendar and commit to your quit date here. Ask a friend or your partner for their help. Set up rules for smoking—such as only smoking outside. Stay away from activities, places or people that make you want to smoke or that put you near smokers. Then, remove smoking reminders—cigarettes, matches, and ashtrays from your purse, home, work and car and clean everything that smells like smoke. 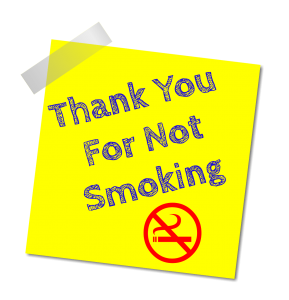 Ideally, you should talk to your health care provider and your insurance company about tools to help you quit smoking. Make sure to take your prenatal vitamin daily. Find tips for choosing one here. Check your dietary intake of these nutrients, which may be needed in larger amounts if you’re a smoker: vitamin C and E, Vitamin B6, B12 and folic acid. 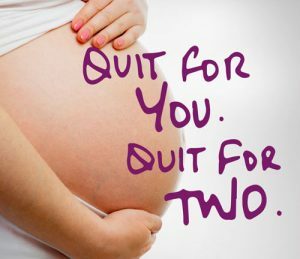 Finally, even if you can’t quit, just smoking less will help! This post was modified from Eating Expectantly by Bridget Swinney MS, RD. « Pregnancy Apps You Need Right Now!